We're halfway through the year, so it's time once again for our biannual gift exchange. Read all about it and sign up here! 'Souls Solder of Love Update! There is no Soldier of Love for this month, but we have some updates for you! Starting this month, winners for SoL must have voted a minimum of five (5) times in the month. The monthly winner will also receive a free doodle avatar from a staff member (rotated monthly and always a surprise!). Additionally, all staff (admins and mods) are now ineligible for this spotlight because it should really be our jobs to lead the way on topsite voting anyway. After much discussion, we've decided to issue a blanket ban on new obtainment of usable-condition, human-made books and human-made clothing. Characters already possessing such human artifacts are okay to keep them as long as they care for and use them realistically. Exceptions may be sought on an individual basis. Characters may no longer "stumble upon" or "find" human-made books in readable condition. It's okay to find books in very poor condition (mold, water damage, torn pages, pages melted together). Realistically made and obtained Luperci-made books are totally okay and encouraged. Characters may no longer "stumble upon" or "find" human-made clothing in nice, clean, usable condition. It's okay to find clothes in very poor condition (torn, mold, washed out colors, absolutely terrible smelling, etc). Realistically made and obtained Luperci-made clothing are totally okay and encouraged. 'Souls has been around for a long time. It has now been thirty years since humans faced mass extinction and their left-behind artifacts have faced thirty years for weather, disaster, scavenging, and decay. Since humans did not have time to prepare for their demise, most artifacts are not protected in any meaningful way and would have been left exposed. Books and clothes are fragile, and realistically, they would not have survived long in usable condition. Additionally, for books in particular, we feel that many players use them as a cop-out to for a character to learn a difficult or obscure skill. Learning something like a language or a martial art from a book is impractical for Luperci for a variety of reasons, but the frequency at which characters find very specific books on such topics as medicine, herbs, and blacksmithing is a bit much. When was the last time you saw a book on these subjects in real life? With enough detail that you could formally train in that topic? Luperci-made books, direct instruction, and practical apprenticeships are all much more viable ways of learning skills and passing on information than relying on human artifacts, and we hope for players to explore these alternatives instead. Human-made clothing, too, is impractical and unrealistic for Luperci for many reasons, in addition to being unlikely to have survived this long. The blanket ban is a reversal of a previous stance, but while we'd still agree that clothing isn't as potentially "overpowering" as books can be, they can offer confusing visuals to newcomers. Leather jackets, tight-fitting skinny jeans, delicate lace dresses, and other types of modern clothing simply don't make sense in a post-human universe. We encourage players to re-familiarize themselves with 'Souls's post-apocalyptic, human extinction environment and all that that entails. Many other human artifacts (this is a new page on the RP Guide!) will have degraded beyond a usable state at this point, and though we aren't explicitly prohibiting other categories of items at this time, we hope players will keep in mind environmental conditions and realistic degradation when considering and writing about human artifacts, as well as consider Luperci-made alternatives. 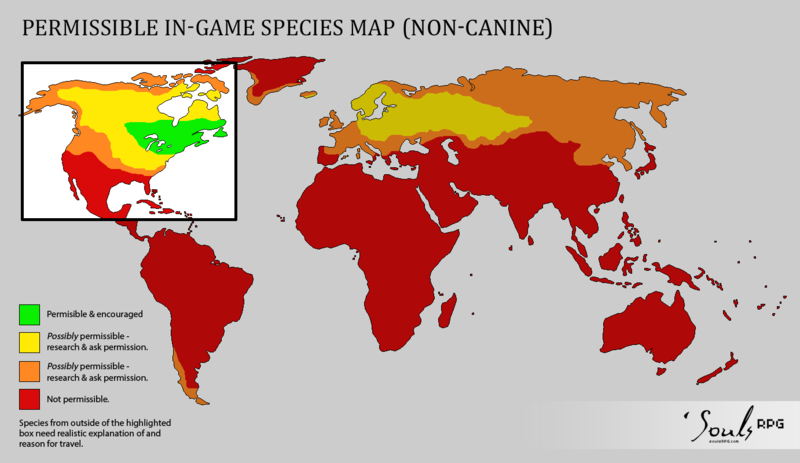 On a similar note, we are blanket banning non-canine species whose ecological range are in red areas on this map from being brought into 'Souls playable territories with the intention of survival. Characters and NPCs meeting that criteria, but which are already in 'Souls territories, may remain as long as realistic measures are taken to ensure their survival. (Click to enlarge). Species originating from orange and yellow areas may be permissible, but we highly encourage players to do their due research on survivability and to check with us prior to introducing the species. Species originating from the green areas are native, permissible, and encouraged. Exceptions may be sought on an individual basis. Please have done your research. Historically, we've found that players seek out exotic species for "cool" factor alone, without regard to the practicality of Luperci desiring, obtaining, transporting, and caring for the species. Often, there is a perfectly suitable native species that would work just as well for whatever plot or role the player has in mind for the animal, but players don't think to consider them from the get-go because they aren't as "cool" or they aren't as "colorful" or they aren't as "cute." It's fine to want cool things, but players have also been unwilling to do their due diligence. This results in staff needing to invest the time to research in order to ensure the viability of a species for that player, often after-the-fact, which can be needlessly time-consuming for staff, and frustrating for both parties, especially if the species is ultimately nonviable. Since more humanistic elements were introduced into the game with the arrival of Syemv in 2005, 'Souls has been a constant balancing act of things allowable for the sake of fun and storytelling and things disallowed for the sake of balance, fairness, and realism. As more and more characters hail from outside 'Souls playable territories and as more and more characters seem to pick up things humans left behind, it becomes, naturally, more and more necessary to place restrictions on things that have gradually become problems. The previous allowance of these things -- books, clothes, exotic animals -- wasn't a big deal when just a few people were interested in them, or when people were willing to put the time and research into tackling them realistically, since no one else had done it before. But when everyone wants these things without wanting to do the same research, misconception spreads, shortcuts are taken, and staff spends a whole lot of time trying to address and fix things after the fact... and we don't catch everything still. And that's not fair to people who did do their research. The game is ever-changing. We don't really feel that these new bans should ultimately affect the creativity of players. Indeed, needing to find ways around the restrictions to still tell the stories you want to tell should be a fun challenge, no? July’s spotlight soul is Kamari Kaiser (Songbird), yay! It has been very exciting to see how Kamari has evolved as she does what she can to bring honor to the Kaiser family. Coming from a very low place in Salsola’s strict social hierarchy, her forcible engagement and ambitious goals continuously drive her forward and it shall be interesting to see what the future has in store for this headstrong young luperci. Raze is the community soul of July, and it is well deserved! Raze has consistently been a very active presence on ‘Souls: on the forum, through roleplay, and on Discord. She’s offered plots for members (new, old, returning) no matter how simple or complex the thread. All of her characters are unique and wonderful, displaying her ability to effectively juggle a multitude of character type. She’s done a fantastic job of handling Inferni for all these years, in addition to being a long standing member of staff and an all around amazing person!